Roast chicken is pure comfort food to me! It is one of the first actual dishes that I remember making when I first lived on my own and really started, really started...cooking. In hindsight, cooking back then was all about developing the basics (whether I realized it or not. Not.). My first roaster was one of those green-painted oval metal deals. Pot roasts, chuck roasts, pork roasts, whole chickens...all with chunks of root vegetables, quartered potatoes and whole cloves of garlic thrown in, a loaf of crusty bread and a bottle of cheap wine, you know...to make it a meal. It was good stuff...satisfying, filling...a big dose of comfort. Over the years, my roasting pan has improved. I actually have 3 to choose from now! I adore my unglazed stoneware roaster, my self-appointed enameled cast iron roaster (I think it's actually a lasagna dish, but it works wonders as a roaster) and my big, handled silver roasting pan which finally allows me to roast whole turkeys (for my favorite meal of the year). So, although my ways and means have evolved over the years, my affinity for good, roast chicken remains unfeathered. Unfettered! I mean unfettered...sheesh. The beautiful simplicity of a roast chicken is probably what lures people in...what lures me in. There are endless flavor combinations, endless methods (breast down, breast up, tied, hangin' loose, stuffed cavity, backbone removed & flattened...need I go on?) and endless personal favorites. 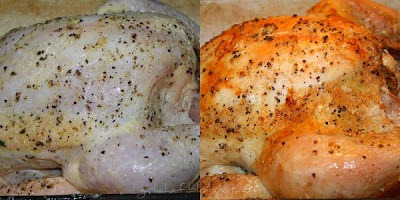 I recently came across a Tyler Florence recipe in the Aug/Sep 2009 issue of Food Network Magazine for Roast Chicken. He was trying to make a great meal for $12 or less (ended up being $2.90/serving). I'm going to enthusiastically say that he succeeded...and so did I when I served it for dinner last night. It was devoured. Bones were picked and fingers were licked. 1. 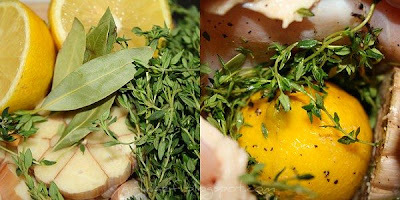 Prepare the chicken: Preheat the oven to 350 degrees F. Season the chicken cavity with plenty of salt and pepper; stuff the lemon halves, garlic, thyme and bay leaves inside. 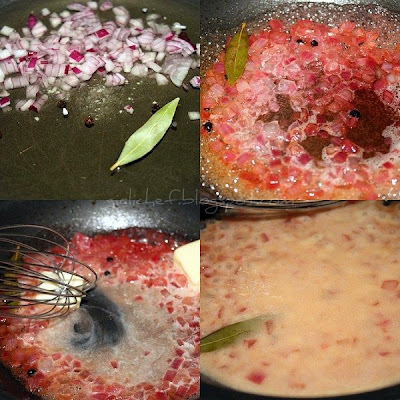 Drizzle the skin with olive oil and rub all over; season with plenty of salt and pepper. Place the chicken breast-side up in a roasting pan; roast for 1 hour, or until an instant-read thermometer inserted into the thigh registers 165 degrees F. Let rest for 15 minutes before carving. I'm going to suggest setting the chicken on a rack to allow the under-side to crisp up as well as the breast-side did. Place the peas in a small pot of salted boiling water until heated through; drain. Toss the peas, lettuce and warm butter sauce (this is called Beurre Blanc...white butter) in a bowl until the lettuce wilts slightly. Serve with the chicken. This was a fabulous meal for summertime...or anytime I'm sure. 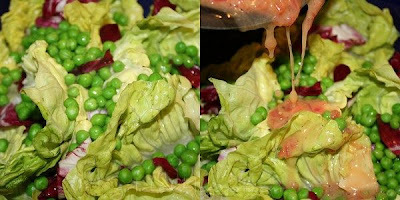 The gorgeous wilted lettuce salad was amazing...the beurre blanc was a silky cover for this mild lettuce, with the sweet little pops of the peas and the addition of the radicchio added a nice little bite. Paired with the beautiful, juicy thyme-essence of the chicken with its golden-crisp skin...I could have been back in my first apartment just as easily as in my current kitchen with my hubby and kiddos. Joy! Be sure to head over to Tyler Florence Fridays to check out what everybody else cooked up with Tyler this week! There's something about chicken that just makes if soooo good. I have one roaster I've used for years and I love it to bits. Wow! Fantastic job on the chicken!!! That looks so inviting and finger-licking, that I'm dying to try it. The combination fits together and the colors of your fotos look great. wonderful meal. thanks for sharing girlichef. Your photos of roast chicken are PERFECT! I agree, there is something about the smell of a kitchen that is roasting a chicken. The aroma says (to me) "everything is well in this kitchen". Isn't that funny? You're right. Roast chicken is nostalgia. 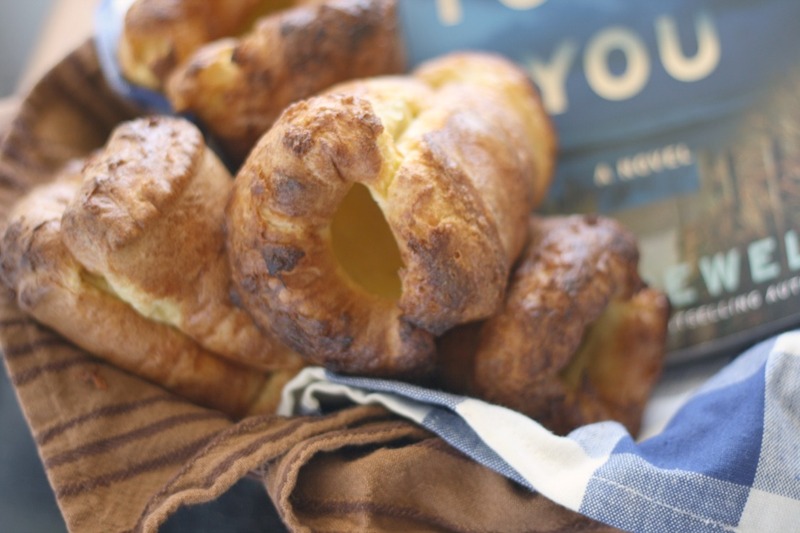 But with your terrific updated recipe, new wonderful food memories are being made. Boy does it look good! And your pix are outstanding!! Love roasted chicken. It's comfort food at its finest. Yours looks wonderful. I should remember to make roasted chicken more often. They say it's what most chefs make at home for themselves on their night off. This looks like perfection! I love the wilted lettuce alongside it. A winner on every count! Beautiful! 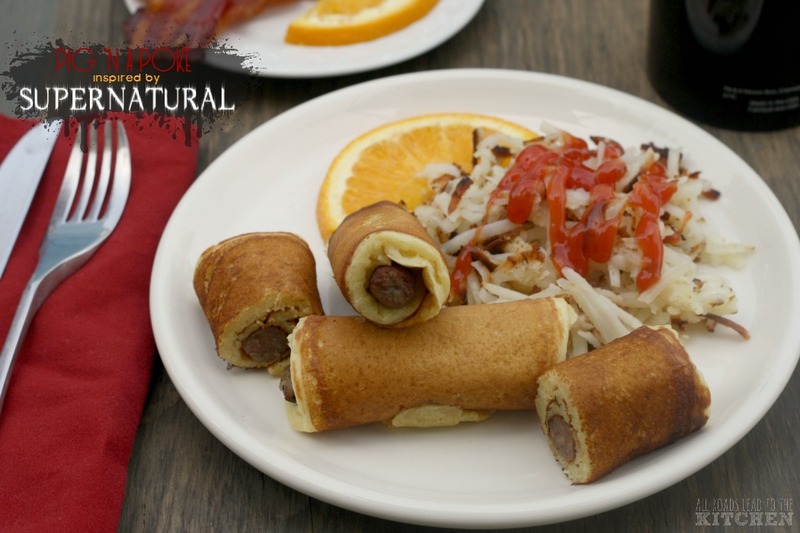 The quintessential American dish! Perfect. And my thyme is in and begging to be snipped. Love the lettuce and peas. Gorgeous meal. I had roasted chicken last night - everything you say is so true - and the way it smells is part of its lure. This looks wonderful with the wilted lettuce! You are right about roast chicken, it is just so comforting and reminds me of home, too. This is a wonderful meal and I'm sure you're family loved it!! Nice!! I definitely do not make enough wilted lettuce salads! Even the photo is comforting! Love this meal! Thanks for the wishes. This chicken looks great. Oh my! This chicken looks amazing! and the lettuce looks so crisp and fresh next to it. Will definitely have to try this! 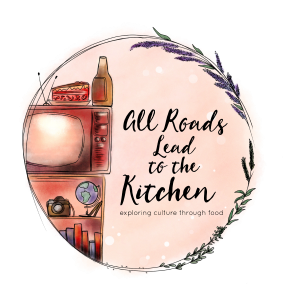 Thanks for visiting my site as I'm looking forward to following you! Your photographs are gorgeous and this sounds like a wonderful meal. I'll bet the aroma of this meal cooking would make grown men weep. I loved every minute of your post. 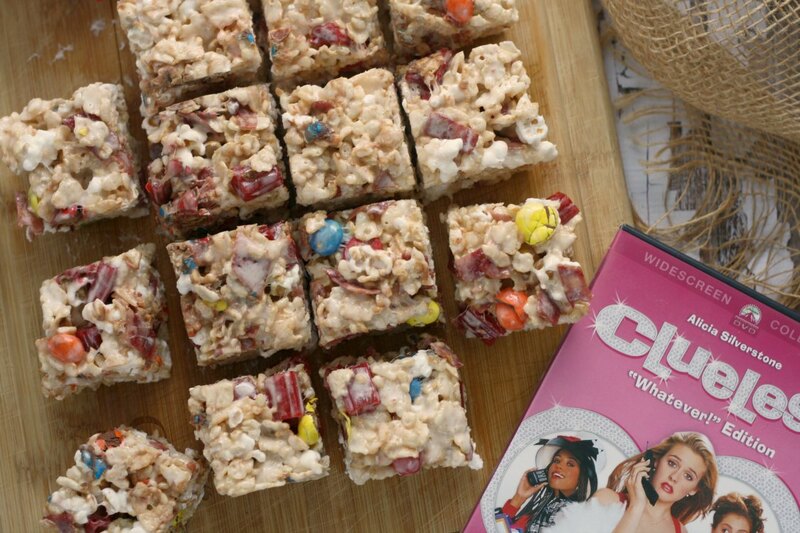 That looks so delicious, Heather! I love roast chicken, and I just picked up this mag at the grocery store. Looks like a winner! I love roast chicken, ANY time of the year. 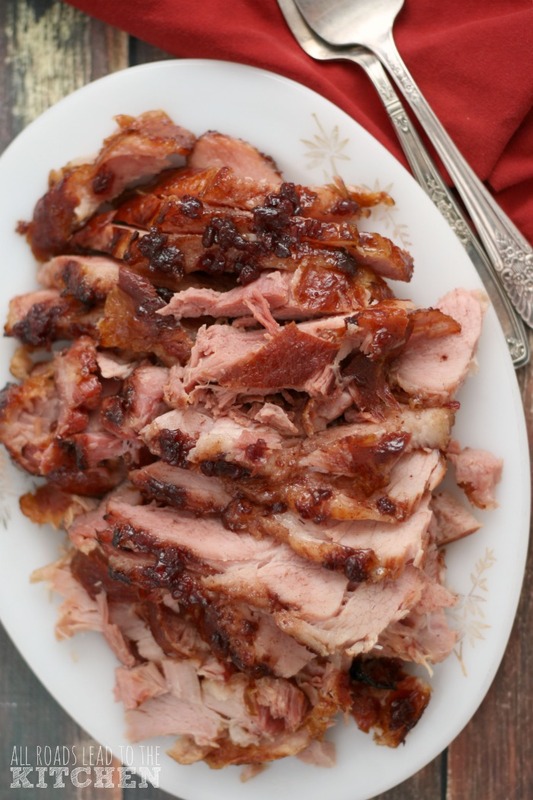 Well seasoned crispy skin, tender and moist meat. And I love Tyler so I'm sure this one can't help but be a winner! Thanks for being such a loyal visitor to my blog - you're a sweetheart!! I love roasted chicken! I remember being so proud of myself when I first made a full fledged roasted chicken dinner....veggie chunks and all. Yours looks wonderful, and even light enough to have for a summer meal with that beautiful salad. As usual you have written such a cute and informative post! foodie licken goodness! This looks so good;truly a comfort meal! Roast chicken is a favorite of mine too! love wilted lettuce! gorgeous photos! 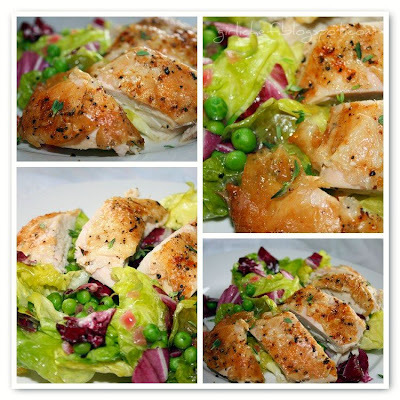 I've made Tyler's roasted chicken, but not with the addition of the wilted lettuce & peas...beautifully accomplished! Congrats on being featured at TF!! Way to go Girli!! Congrats! This looks absolutely fabulous! Sounds and looks delicious!!! Perfect for any night, but especially summer with those peas! This looks delicious!! I always have trouble with whole chickens, but I can make a whole turkey like nobodies business!! LOL!!! Thanks for your nice comment on my red cake too!! Your Chicken looks and peas so Amazing! Great comfort Summer food. This is truly a beautiful, colorful, and comforting looking dish!! I spotted this in one of his cookbooks and have been wanting to make it. Yours just looks great : ) Silly me made the Tyler dish and was so excited about my 101st post and giveaway that I forgot to email to the Tff roundup. 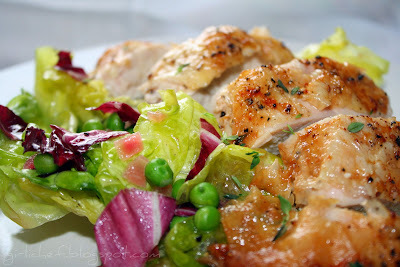 Gorgeous chicken and I love th wilted lettuce and peas too. There is nothing better than the smell and taste of a roasted chicken! 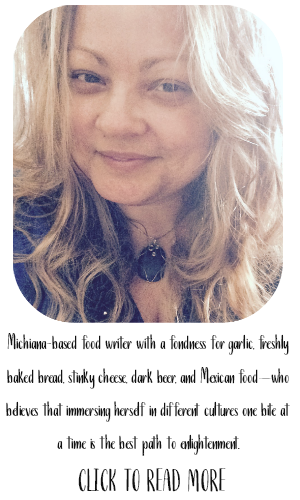 Congrats on being the featured recipe this week for TFF. I look forward to seeing you on his site next week! Hey there girli, this really is comfort food. I love chicken prepared in every way possible, but roasted is my favorite. Beautiful photos. Have a lovely weekend. I have roasted a half chicken but that really doesn't count! 8-D The first photo shows such perfect chicken and the salad is so vibrant. All around, this is a marvelous dish! I can not believe I haven't been to visit you in over 2 weeks!! I'm still a huge fan and will catch up with all that I've missed! Wow, that chicken looks so delicious and a great colorful dish, I will try it! Geez, I don't even eat meat and this chicken looks yummy! I will be making your lettuce and peas, totally delish sounding and unique! It's so hard to mess up a roast chicken. Sure the skin may not be as crisp, but it's always good and comforting. Your photos look exceptionally beautiful and colorful today. well done. This looks lovely. 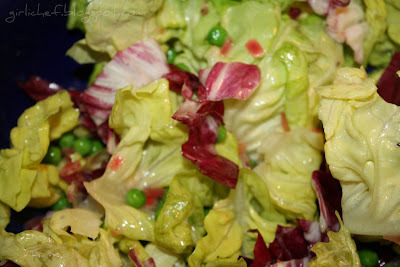 I especially like the colors of the butter lettuce and peas. I've made two of Tyler's roast chicken recipes, and now I guess I'll be making a third one! Looks wonderful, just look at that color! Hey, girlichef, I'm back! And this chicken looks so fabulous! These are the flavors I make mine with but yours seems to have come out so much prettier! This lettuce sidedish is brilliant! I made this in the winter and I was amazed at how perfect it came out. Tyler Florence doesn't get enough credit! I need to get one of his cookbooks! Beautiful photos by the way! This is so colorful and perfectly cooked! Lovely. Roast chicken is still one of the cooking feats that i haven't attempted yet. I'm not quite sure why...maybe it's because I don't have a good roasting pan. What a great entry, though and congrats on being featured on Ty's website! You read my mind! I just finished roasting a chicken because I needed the comfort for the soul. I like you side of wilted lettuce, I would have never thought of that! Oh my goodness, even the pictures are comforting! I love this! What a gorgeous roasted chicken that is! gotta try this too as soon as I find a whole chicken around here. Yay!!! THE Tyler Florence post!